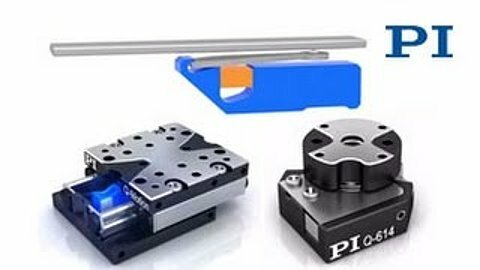 PI's new Q-Motion miniature linear and rotary positioners are are based on the piezo-inertia motion effect and ideal for motion and alignment applications involving optics alignment and assembly, microscopy, beam-line instrumentation, medical engineering, and bio-technology. The drive principle is based on a cost-efficient piezo inertia drive motor (stick-slip). Stages and drive can be customized for larger production quantities. The self-clamping motor design provides long-term power-off position-hold capabilities without the need for a brake -- another space and energy saving advantage of the Q-Motion positioner series. The Q-521 and Q-522 linear positioners are some of the smallest precision motion stages currently available on the market. Their innovative miniature drive allows for velocity up to 10mm/sec with very high resolution. These ultra-compact positioning devices are only 21mm wide come with travel ranges from ¼” to 32mm. Low-cost open and closed-loop versions are available, linear encoder resolutions from 1 nanometer to 4 nanometer are offered. 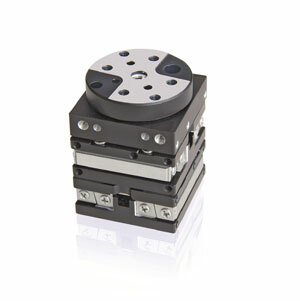 In addition to the compact linear motor stages, a new series of rotary positioners is also available. Starting with table diameters of only 14mm, the Q-614 rotation stage is currently the smallest 360 degree rotary positioner in PI’s portfolio. The Q-632 32mm diameter stage has an ultra-low profile of only 7mm. The Q-622 22mm model is designed to mount directly to the Q-522 linear stage series without the need for adapter plates. Q-motion stages can be combined to for very compact and elegant multi-axis positioning systems. The example below shows an XY-Theta-Z that fits inside an envelope of 22x22x30mm. Q-motion positioners are driven by tiny PIShift type piezo ceramic inertia motors. They provide several advantages over classical motors: smaller, lower energy consumption, nanometer resolution and self-locking, i.e. at the end of each move, the platform is locked into place with no drift and no current draw. This feature provides better stability and removes the need for a motor brake. Precision positioning and alignment of compact opto-mechanical components both in research and OEM instrumentation. Fields of application include photonics, bio-technology, nanotechnology, precision-optics, life-sciences and medical design. Several options are available for the Q-521 and Q-522 stage series, from economical open-loop designs, to low-cost closed-loop versions and high-end feedback sensors providing 1nm resolution. Vacuum compatible stages are also offered and a non-magnetic option is in preparation. Q-614, Q-622 and Q-632 are the rotary stages currently available. They provide continous rotation range (<360°) with minimum incremental motion as small as 36 µrad.